“Welcome back ! 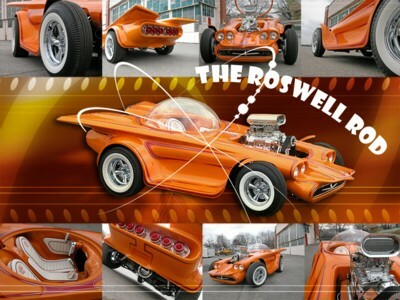 This week I’ve gotten into the Hall Of Fame Legends Archives to pull out a story you’ve probably missed: It’s Fritz Schenck with his tale of a very cool, custom-built, show car…”The Roswell Rod” ! FRITZ SCHENCK (Spritz By Fritz), is in the vanguard of the new breed of builders/customizers. You’ve probably seen THE ROSWELL ROD, and some of his other cars, clones, restorations, bikes, or, paint jobs, featured in Rod & Custom, Street Rodder, Custom Rodder, etc. Well, a few years ago, Fritz and I sat down, relaxed, and talked about his cars, then-current & future, plus his views on “creating art” through Rolling Sculpture. Fritz is a cool guy with lots of talent. To “hear all about it” just CLICK-ON-HERE , listen, and…Enjoy ! BTW: Have a GREAT weekend, and Cruise Travis’ super-cool Site while you’re here…check-out the available Merch, there’s bound to be something you need ! Or, hey, pick-up something to give to one of your buddies ! !